Those looking for a local pharmacy to fill their prescriptions now have another option. ALLEN PARK – Those looking for a local pharmacy to fill their prescriptions now have another option. Champaign Family Pharmacy, opened this month, is a full-service pharmacy open six days a week to meet customers’ pharmaceutical needs. “We are focused on customers’ health and well-being, providing quality service and getting scripts filled quickly,” owner Ghada Abdallah said. 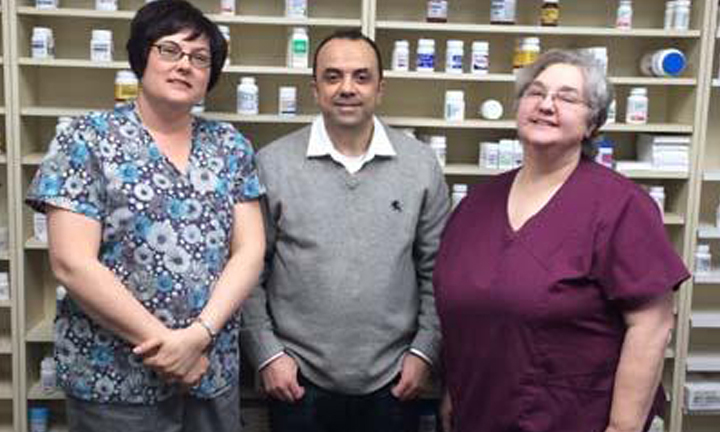 Head pharmacist Moe Dabaja and pharmacy technicians Nancy Kizuka and Kim Drouillard form an experienced, seasoned team at the new pharmacy. “They know everyone by name, including their drug history and allergies,” Abdallah said. “Every time a customer comes in with a new prescription it is screened against their profile to make sure there are no drug interactions or adverse reactions.” The pharmacy also sells basic over-the-counter medicines and specializes in smoking cessation and the treatment of diabetes. “By next fall we will be offering flu, shingles and pneumonia vaccines on site, given by the pharmacist,” she said. Abdallah, a pharmacist herself, said Allen Park was the perfect place to open a new pharmacy. “I know the area well,” she said. “We are very happy to be in Allen Park. This is a very friendly and cozy location. Champaign Family Pharmacy joins Abdallah’s two other locations in Grosse Pointe and St. Clair Shores. “We’ve had a really good response since we opened,” she said. The pharmacy accepts any and all insurance plans. A grand-opening party is slated for early March and will include appetizers, customer specials and giveaways. Champaign Family Pharmacy is at 14726 Champaign Road. The pharmacy is open from 9 a.m. to 7 p.m. Mondays through Fridays and 10 a.m. to 2 p.m. Saturdays. It is closed Sundays and major holidays. For more information, call the pharmacy at 1-313-382-0000 or “like” its Facebook page. We are dedicated to the health and well-being of our patients. We are concerned with all aspects of our patients health, including their physical, mental and emotional well-being, in every stage of development and in good health or in illness.